Prague, 9 March 2016 – Marani Architects is pleased to announce the launch of its new partnership with Rudolf Vyhnálek of CAD Consulting and Prague-based architect Tomáš Jeníček, in a venture that will open up the Czech market and bring the latest BIM (Building Information Modelling) technologies to these projects. Marani Architects – founded by Vincent Marani, who for the past 17 years has been at the forefront of bringing to the Czech Republic modern building techniques, especially in the office segment, first with the American company Murphy/Jahn and then at Cigler Marani – is involved with a range of landmark projects in the Czech Republic and across the region. 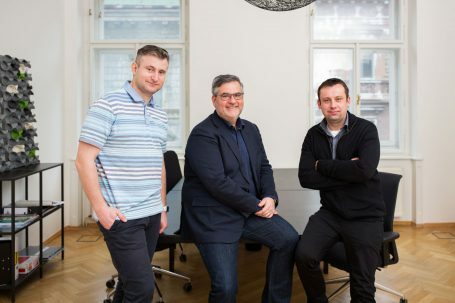 In teaming up with Rudolf Vyhnálek, a pioneer in the implementation of BIM, Marani Architects is looking to bring new generation technology to all its projects in the Czech Republic and abroad. “I am delighted to be teaming up with Rudolf Vyhnálek, who has been instrumental in bringing BIM technologies to the Czech Republic. BIM technology is fast becoming indispensable in architecture – in a growing number of countries like the United Arab Emirates all state and municipal projects are now required to use BIM – and Revit® software is at the cutting edge of this,” says Marani. “And having a local partner as talented as Tomáš Jeníček, with all his experience in permitting and design, is a big honour that will help drive Marani Architect’s business,” says Marani. In further news, Marani Architects and CAD Consulting have, in collaboration with a local Emirate partner, established a company in Dubai called I Rivet, which will offer architectural BIM consultancy services. “We intend to offer to architects, engineers, general contractors and subcontractors in Dubai BIM modelling services. Since 2016, the law is that BIM modelling is essential in the United Arab Emirates for all state projects and all private projects of more than 30,000 square meters, so there is a big and growing demand for experts who can provide these services,” says Marani.